There were three main types of guns emplaced at Point Nepean during its long history. The introduction of rifled muzzle loaders (also classed as RMLs) rendered smoothbore guns largely obsolete. However, the 68-pounder and other smoothbores still existed in large numbers and various attempts were made to adapt the guns to fire new projectiles. Eventually Captain William Palliser patented a method of boring out the gun barrel and inserting a wrought iron rifled liner. This allowed rifled shot and shells to be fired from old smoothbore cannon and experiments revealed that it made them even more powerful than they had been before. Introduced in 1872, 68-pounders adapted in this way had a calibre of 6.3 inches (16.00 cm) and were known as a RML 68-pounder, or officially as the RML 80-pounder 5 ton. With a 10 lb (4.5 kg) powder charge they could fire an 80 lb (36 kg) projectile at a muzzle velocity of 1,240 feet per second (380 m/s). They were deployed as coast defence and garrison artillery around the British Empire and remained in service until eventually declared obsolete in 1921. The RML 9 inch guns Mark I – Mark VI were large rifled muzzle-loading guns used as primary armament on smaller British ironclad battleships and secondary armament on larger battleships, and also ashore for coast defence. The rifling was the “Woolwich” pattern of a relatively small number of broad, rounded shallow grooves : there were 6 grooves, increasing from 0 to 1 turn in 45 calibres (i.e. 405 inches). The BL 6 inch gun Mk V was an early Elswick Ordnance Company (later becoming Sir W.G. Armstrong & Company) breech-loading naval gun originally designed to use the old gunpowder propellants. They were used for coast defence around the British Empire. This was an Elswick Ordnance export design, completely different to and longer (30-calibres, 183.5 inch bore) than the contemporary 26-calibres British naval service 6-inch Mk III, IV and VI guns designed by the Royal Gun Factory, although it fired the same 100-pound projectiles. The gun was of a complex all-steel built-up construction, of a steel A-tube surrounded by multiple steel hoops, breech-piece and jacket. Several were acquired by the British government for coast defence in the UK and were given the designation 6-inch gun Mark V. The breech fittings and firing mechanism were modified in British service to standardize them with the British service guns, Mark IV and VI. The breech-screw was locked by turning to the left, unlike standard service guns made by the Royal Gun Factory, which all locked to the right. Rifling consisted of 28 grooves of the polygroove “Elswick section” type, increasing from 0 to 1 turn in 30 calibres (i.e. 1 turn in 180 inches) at the muzzle. They were also exported for use as coastal defence guns in Hong Kong, New Zealand, Australian colonies and Siam (Thailand), typically as disappearing guns. 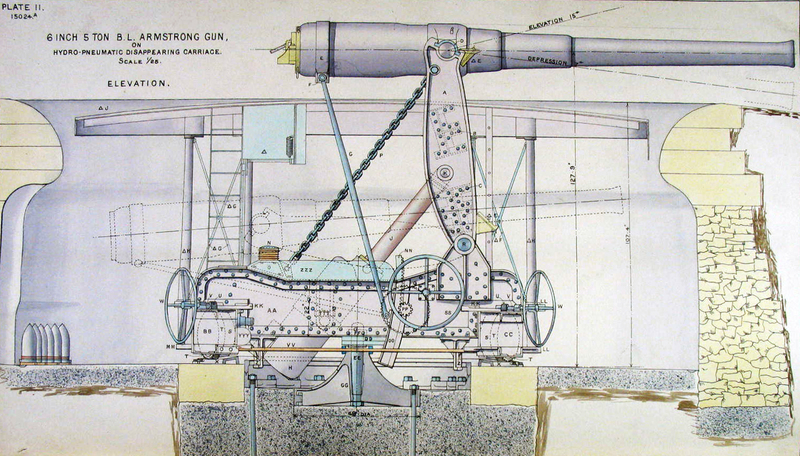 The diagram above shows the Sir W.G.Armstrong Mitchell & Company built Armstrong BL 6-inch gun on Centre Pivot Barbette mounting, as supplied to Australian colonies. The gun superseded the QF 6-inch gun of the 1890s, a period during which the Royal Navy had evaluated QF technology (i.e. loading propellant charges in brass cartridge cases) for all classes of guns up to 6 inch to increase rates of fire. BL Mk VII returned to loading charges in silk bags after it was determined that with new single-action breech mechanisms a 6-inch BL gun could be loaded, vent tube inserted and fired as quickly as a QF 6 inch gun. Cordite charges in silk bags stored for a BL gun were also considered to represent a considerable saving in weight and magazine space compared to the bulky brass QF cartridge cases. The 6-inch Mk VII gun, together with the 9.2-inch Mk X gun, provided the main coast defence throughout the British Empire, from the early 1900s until the abolition of coast artillery in the 1950s. Many guns were specially built for army coast defence use, and following the decommissioning of many obsolete cruisers and battleships after World War I, their 6-inch Mk VII guns were also recycled for coast defence. 103 of these guns were in service in World War I in coastal defences around the UK. Some of these, together with others at ports around the wider British Empire, played an important defence role in World War II and remained in service until the 1950s. It also made reloading easier, since it lowered the breech to a level just above the loading platform, and shells could be rolled right up to the open breech for loading and ramming. Although it had these advantages, the disappearing carriage was also a complicated mechanism. The disappearing gun was usually moved down behind the parapet or into its protective housing by the force of its own recoil, which (on many models) lifted a counterweight. Before firing, the crew tripped a catch on the counterweight, causing it to fall into a well at the center of the gun position and move the gun back up “into battery” (firing position). The carriage design restricted maximum elevation to under 20 degrees and thus lacked the necessary range to match newer naval guns entering service during the early part of the 20th century. The additional elevation gained by mounting the same gun on a later non-disappearing carriage increased their range. The time taken for the gun to swing up and down and be reloaded slowed the rate of fire. 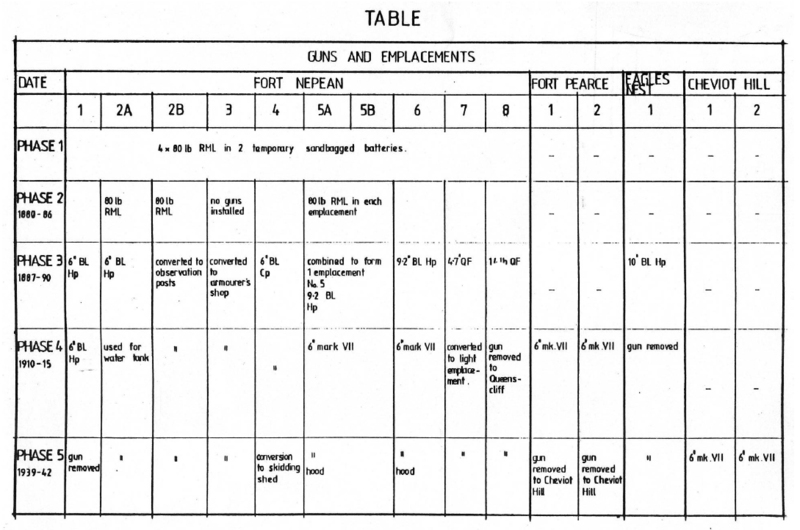 Surviving records indicate a rate of fire of 1 round per 1 to 2 minutes for an 8-inch (20 cm) gun, significantly slower than less complicated guns. The improvement in the speed of warships demanded an increased rate of firing. The disappearing gun was at a disadvantage compared with a gun that stayed in position as one could not aim or reposition a disappearing gun while it was in the lowered position. The gunner still had to climb atop the weapon via an elevated platform to sight and lay the weapon after it was returned to firing position, or receive fire control information (range and bearing) transmitted from a remote location. Their relative size and complexity also made them expensive compared with non-disappearing mounts. The QF 14 pounder was a 3-inch medium-velocity naval gun used to equip warships for defence against torpedo boats. It was produced for export by Maxim-Nordenfelt (later Vickers, Sons and Maxim) in competition with the Elswick QF 12-pounder 12 cwt and QF 12-pounder 18 cwt guns.